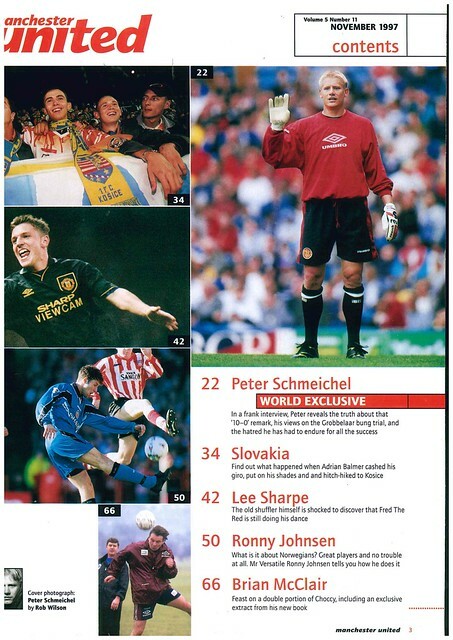 Peter Schmeichel is the cover star of this edition of Manchester United’s official magazine as the Winter months of 1997 approach. 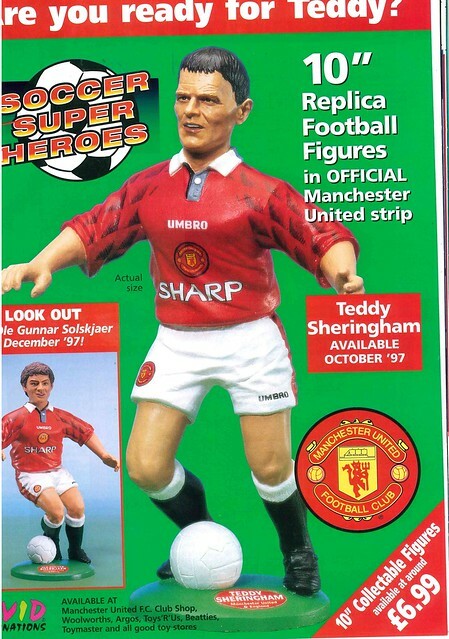 In news, former United star Andrei Kanchelskis says he regrets leaving United and how he loved living in Manchester. 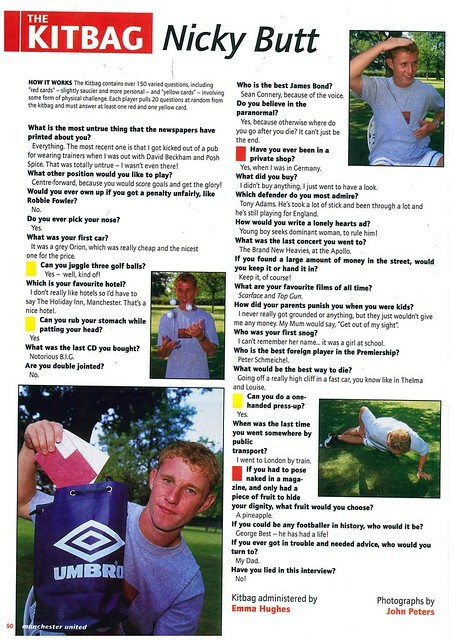 In 2001, he would join City on loan. 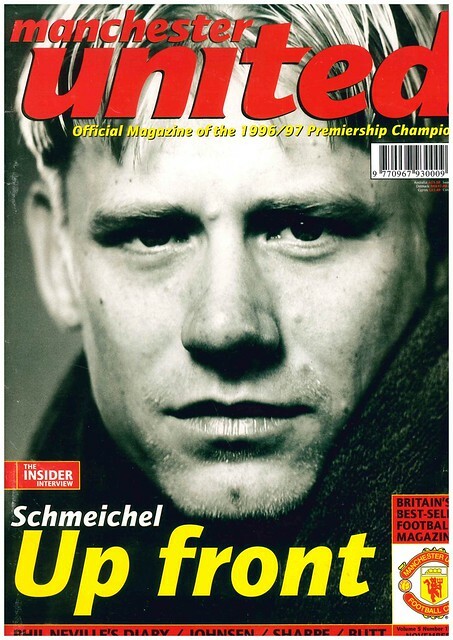 Cover star Schmeichel gives a five page interview where he complains about the atmosphere at Old Trafford. 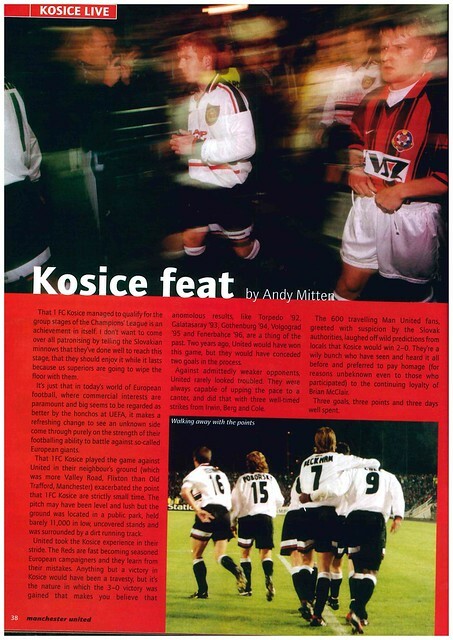 There is a look back at United’s recent European Cup game away to Kosice, looking at how football in Slovakia is coping in the years following a split from Czechoslovakia. 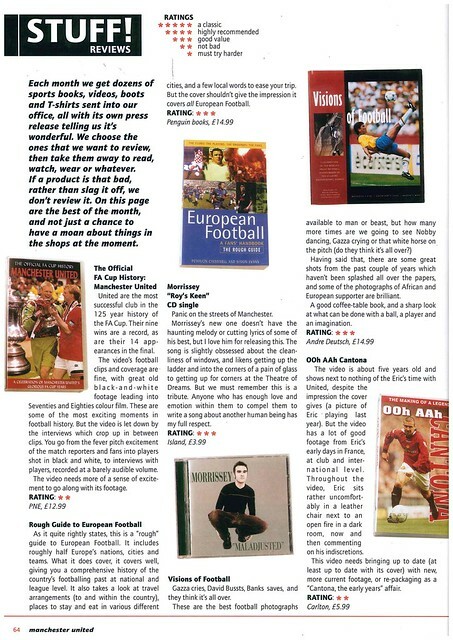 With the internet still in it’s infancy, there is a double page spread on the best football sites on the net. 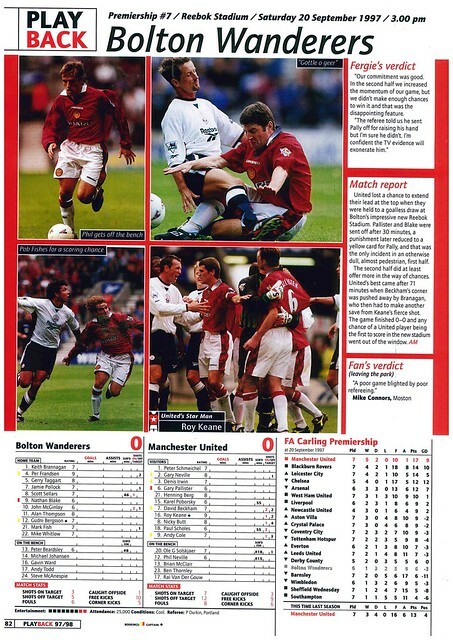 Ronny Johnsen gets a three page interview, hoping for a Norway v England meeting at the following year’s World Cup, simply for the number of United players involved. 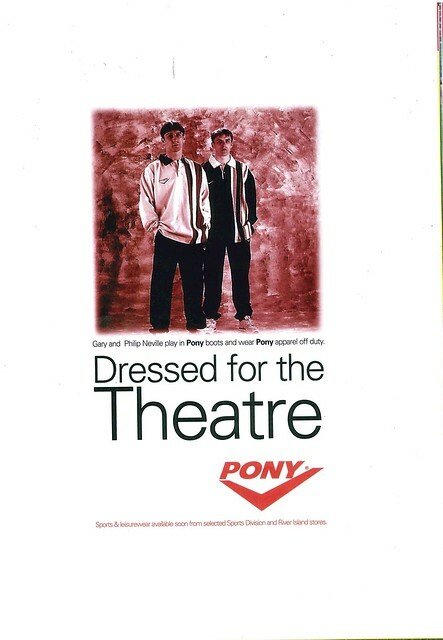 In adverts, Gary and Phil Neville appear in an advert for American sportswear firm Pony. 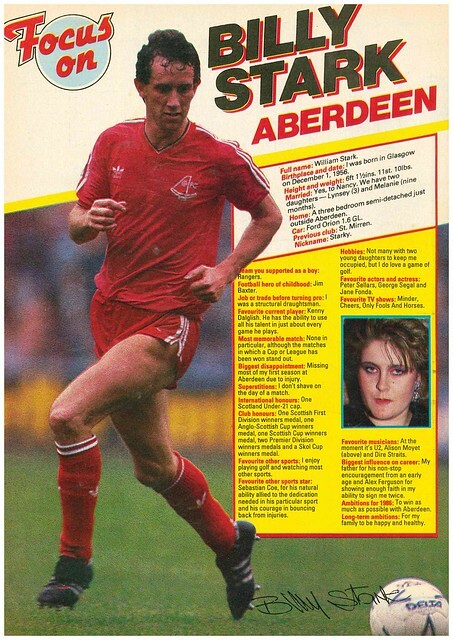 Brian McClair has his diary in a month where he gets a three page profile due to his autobiography being out, revealing that he wanted to be a punk as a teenager. As usual, the magazine ends with a review of recent games, and a preview of upcoming games. If Estonia’s last visit to Windsor Park was one of Northern Ireland’s lowest points in recent years, Belarus only previous visit to South Belfast was one of the highest points. It was a gloriously warm Friday night in late May 2016. We didn’t know if the heat was because of the sunshine or because of Will Grigg. We were seeing the team off in their last home game before heading to the European Championship in France, we were on an unbeaten run, we were going to win it. 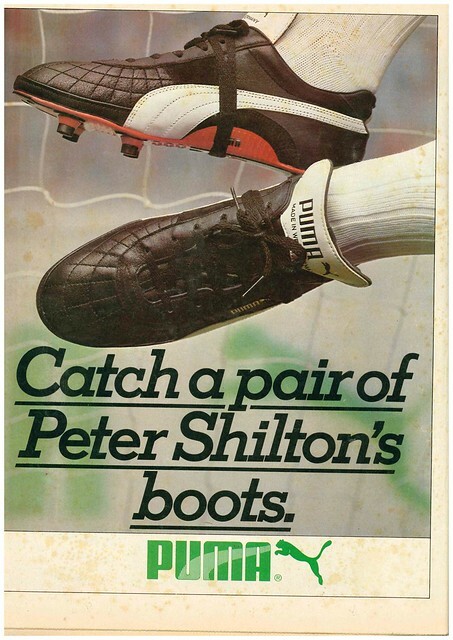 If you hadn’t seen such riches, you could live with being poor. 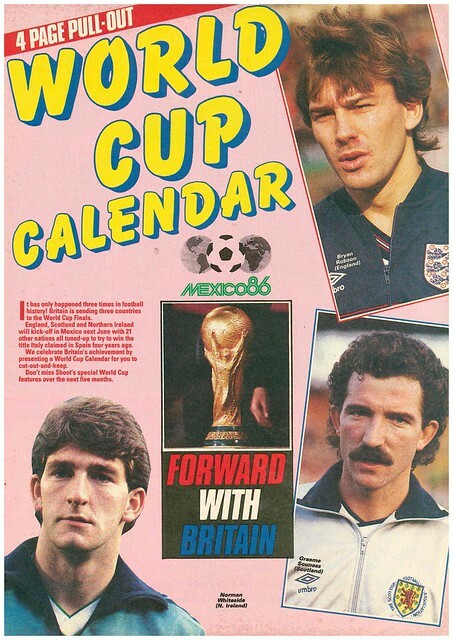 We loved the experience of going to a major tournament, and all the little spin-offs such as sticker books, send-off home matches and newspaper pull-outs, we want to do it all again in Euro 2020. 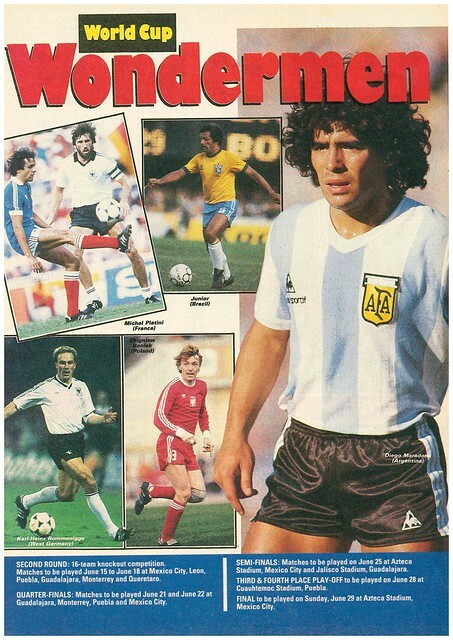 It will be tough though, with Northern Ireland in Pot 3 behind two former European Champions and two heavyweights. However, Germany and Holland are two heavyweights trying to rebuild their reputation after humiliating failures in recent years. However, 3rd place may not be enough for Northern Ireland to secure a Play-Off place thanks to the farce that is the Nations League. If the group goes to form based on the seedings, Northern Ireland finish 3rd and Belarus 5th, Northern Ireland won’t be guaranteed a Play-Off whole Belarus will be on the basis of winning their group in League D.
There were idiots in our support who kept saying the UEFA Nations League was a great opportunity to help Northern Ireland qualify. How? It is nothing more than a reward for mediocrity. There will be a 3rd place team who misses out to a team who finishes 5th or 6th in their group. This will blow up in a big way in November. Northern Ireland would be guaranteed a Play-Off if Bosnia-Herzegovina and Austria qualify automatically. Bosnia-Herzegovina blew a 2-0 lead at home to one of their main rivals, while Austria have lost their opening two games in the weakest group. Useless showers. Northern Ireland can only help themselves, and they found themselves camped in the Belarus half in the opening minutes of the game, but the best they could offer was a Paddy McNair shot saved by the keeper. Kyle Lafferty had a shot turned around for a corner, a corner which brought Northern Ireland their opening goal when Jonny Evans found himself free in the box to head home from close range. Pointless stat, but it was Northern Ireland’s first goal in the first-half of a competitive game since Chris Brunt scored against Czech Republic in 2017, nine games ago. All the clichés about not giving Belarus something to defend and the floodgates opening for Northern Ireland were soon wiped out within a couple of minutes when a shot from Ihar Stasevich was deflected and looped up and over Bailey Peacock-Farrell. It was like a recreation of Andreas Brehme’s goal against England at the 1990 World Cup. I was behind the goal it was scored in, and you knew what was going to happen as soon as the ball looped up. Windsor Park fell silent, apart from a small pocket of Belarus fans in the corner of North Stand and Railway Stand. This was a game that Northern Ireland had to win, and the best way of making that happen looked like it was going to come down the left hand side with the duo of Jamal Lewis and Jordan Jones, where most of Northern Ireland’s play was going to. Jones looked like he was going to set up a second for Northern Ireland but his cross went agonisingly across the box but nobody was able to get on the end of it. Paddy McNair had a shot blocked as Northern Ireland’s pressure continued in search of a second goal that would not come. As each minute passed, it became inevitable that Northern Ireland would turn to their bench. First up, was Josh Magennis for Niall McGinn, then it was Liam Boyce for Kyle Lafferty. You might say i’m being biased, but I was hoping that the third sub would be Paul Smyth. It wasn’t, as Shane Ferguson came on for Jordan Jones. It was a sub that made sense though, as Jones was getting into good position out the left but the final ball was missing. If Ferguson could get into the same position, his left foot could provide a final ball that could be productive for Northern Ireland. A small section of supporters in the quadrant between The Kop and North Stand began singing “Kop Stand Kop Stand, sing us a song”, to which The Kop responded “Who are ya? Who are ya? Good point actually, who are they? Are they Kop? Are they North Stand? What stand are they in? It looked like the winner was never going to come. With just minutes remaining, the ball fell to Josh Magennis. It was set up for him to shoot but he couldn’t get a clear strike on goal. He ended up passing it, and within seconds, was on the end of a cross, finding that elusive space to turn the ball home. Windsor Park erupted in celebration. He doesn’t score many, but when he does, it’s vital. That second goal against Greece, breaking the deadlock on a frustrating night in San Marino. 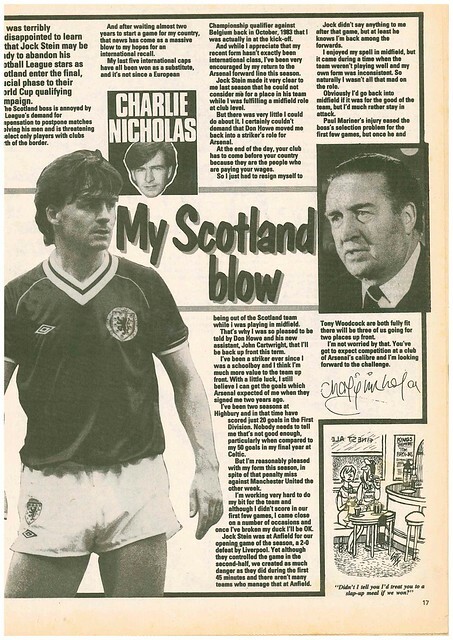 Even his consolation goal against Germany felt important at the time. The common consensus, would that this would be enough for Northern Ireland, but it almost wasn’t. With less than a minute of injury time remaining, Bailey Peacock-Farrell had to save at the feet of a Belarus striker who looked set to score from a few yards out. Northern Ireland held on and got the win, making it two wins out of two. They were two games they were expected to win, but they still had to go out there and get the win. 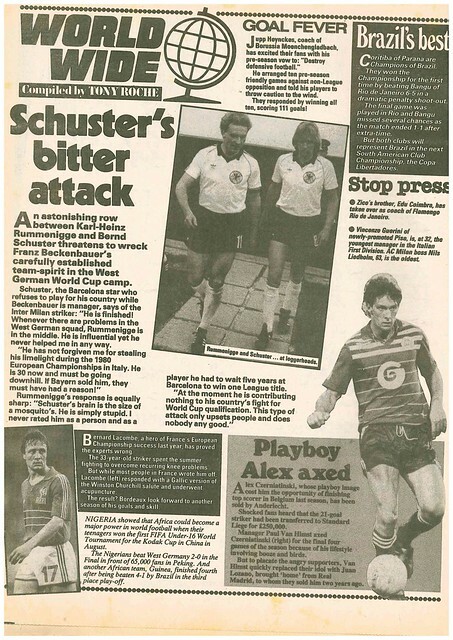 Elsewhere in the group, Germany beat Holland 3-2. It’s hard what to want when Germany meet Holland. Logically, a draw wouldn’t be bad, but it might not be a bad thing if Germany win both games. That means that if Northern Ireland win away to Belarus and Estonia, and even if they lose home and away to Germany, they will effectively be in a Play-Off with Holland. Given the choice, you’d rather be in that situation with Holland than Germany. Even though Holland and Germany are both trying to rebuild their reputations after humiliating failures in recent years, it is Holland who have had the greater fall, and failure to reach the last two tournaments will still be on their mind until they get over the line in this one. Due to their involvement in the UEFA Nations League, Holland won’t be playing any qualifiers in June while Northern Ireland play twice. This makes them even more of a must-win set of games than they already are. If we do, we’ll have a nine point advantage over the Dutch, and put all the pressure on them come September. For once, the UEFA Nonsense League will be doing Northern Ireland a favour. 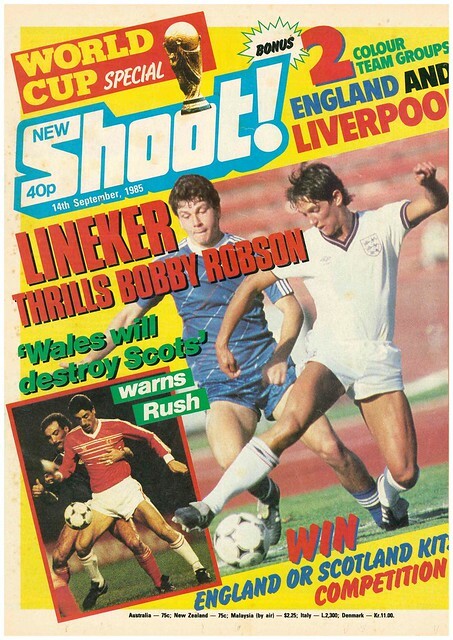 It’s a cup edition of Shoot this week, with the FA Cup 3rd Round, and a World Cup calendar included in this edition. 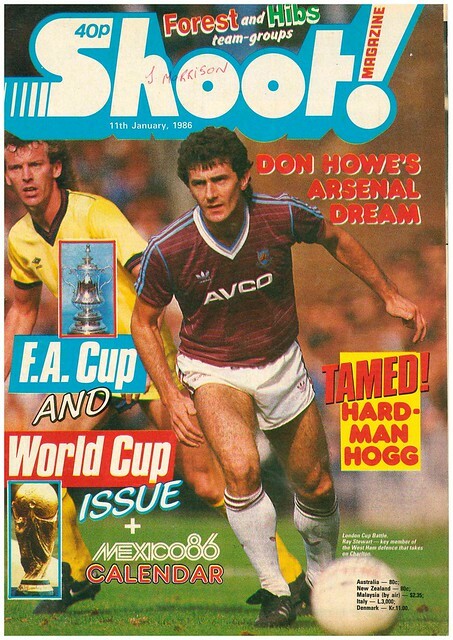 The cover star, Ray Stewart of West Ham and Scotland, was hoping for glory in both. 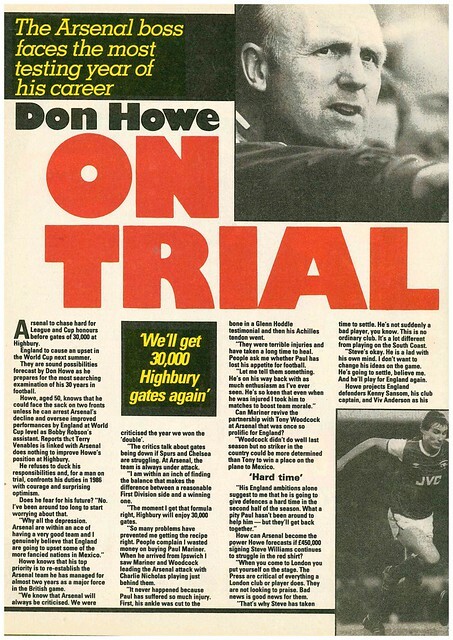 Don Howe is interviewed, where he says he knows he could lose his job as Arsenal manager and his role in the England coaching set-up if both teams fail in 1986. Manchester United’s FA Cup tie against Rochdale is previewed, with Shoot warning that Steve Taylor could be Rochdale’s danger man. 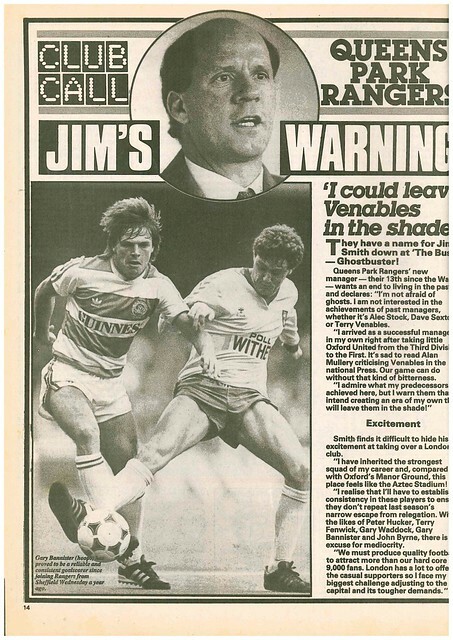 Nigel Callaghan gets a full page profile after handing in a transfer request at Watford, but denies he has had a bust-up with manager Graham Taylor. 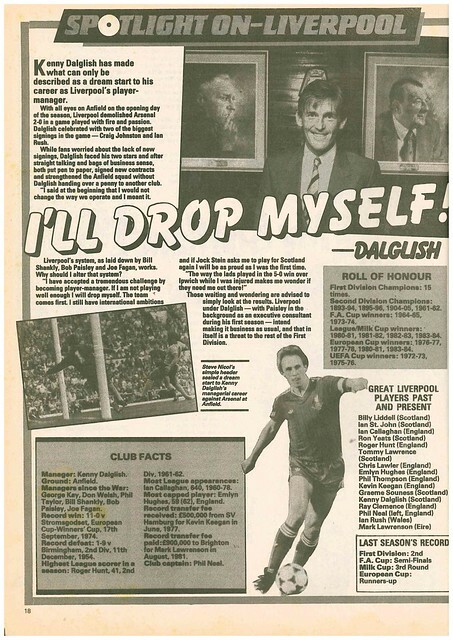 Jan Molby gets a full page feature, crediting Kenny Dalglish for his turnaround in form, and revealing that he practices free-kicks. 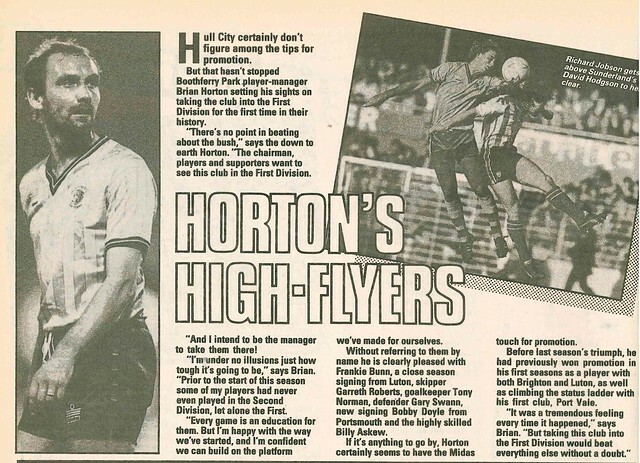 Mick Harford also gets a full page feature, but it’s the opposite from Molby’s piece, which sees manager (David Pleat) praising player, stating that the Luton forward should be in the England squad. 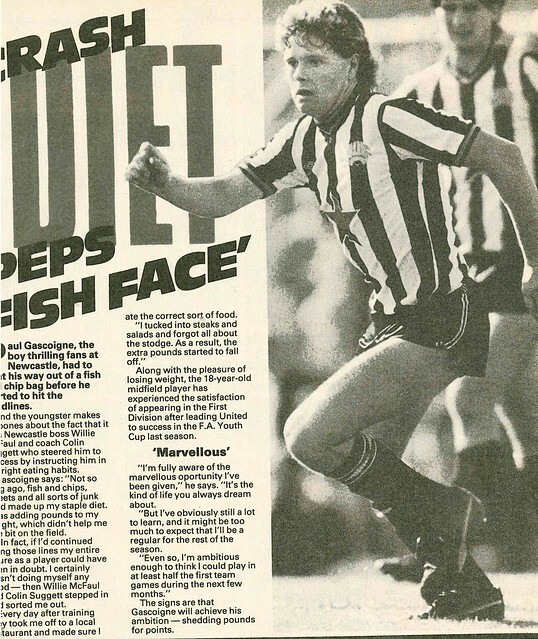 It’s all one big love-in this week, with Paul Gascoigne of Newcastle United crediting manager Willie McFaul with the weight loss that has enabled him to be a professional footballer. 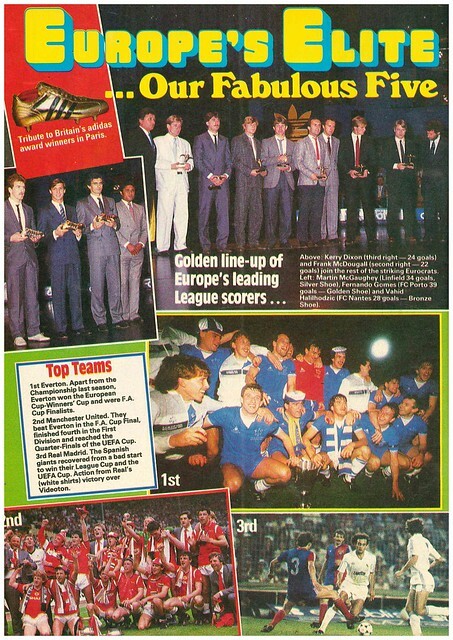 Despite English clubs being banned from Europe, they were well represented in the Adidas Awards, with Everton beating Manchester United to Team Of The Year, while Kerry Dixon was a finalist for Golden Boot, alongside Frank McDougall of Scotland and Martin McGaughey of Northern Ireland. 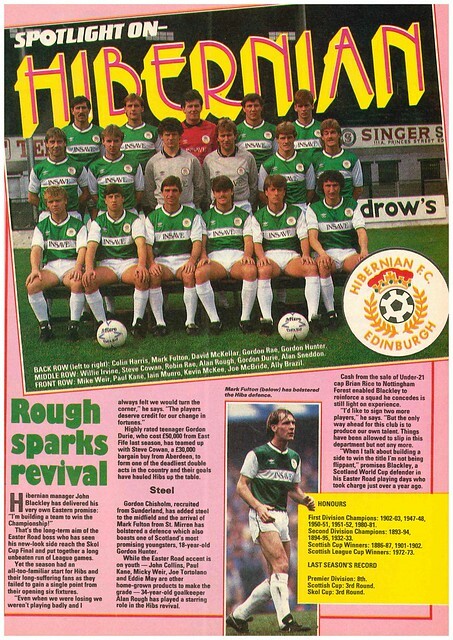 Hibs get a team profile where manager John Blackley declares he is building a team with ambitions of winning the league. 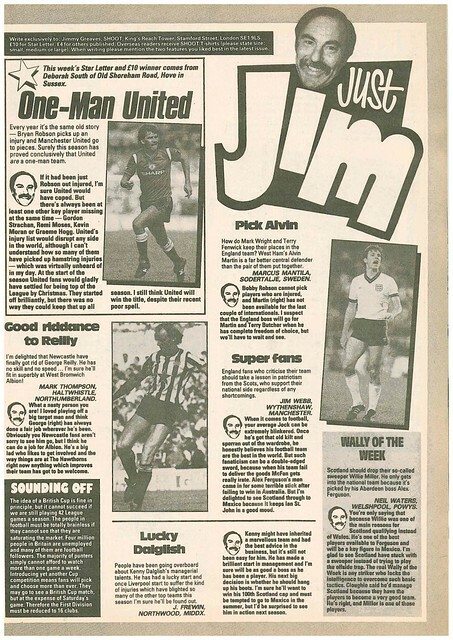 In news, Ian Greaves turned down the job as West Brom manager because they are sponsored by an anti smoking body and he is a dedicated smoker, Aston Villa want to sign Kevin Richardson from Everton, and Tommy Docherty dismisses England’s World Cup chances. His favourite music is U2, Alison Moyet and Dire Straits. The last time Estonia visited Windsor Park, it was one of Northern Ireland’s lowest points in recent history. It was October 2011, nearing the end of Nigel Worthington’s second full campaign as manager, both of which saw group favourites (Czech Republic/Poland in 2010, and Serbia in 2012) fail to qualify and minnows take advantage of it, but we weren’t the minnows taking advantage. If Slovenia can reach a World Cup, why can’t we? If Estonia can reach a European Championship Play-Off, why can’t we? It was grim, we couldn’t win a game, it felt like we would never win another game, and nobody wanted to play for us. Unsurprisingly, Nigel Worthington’s time as manager was up, a new man was needed to take us forward. 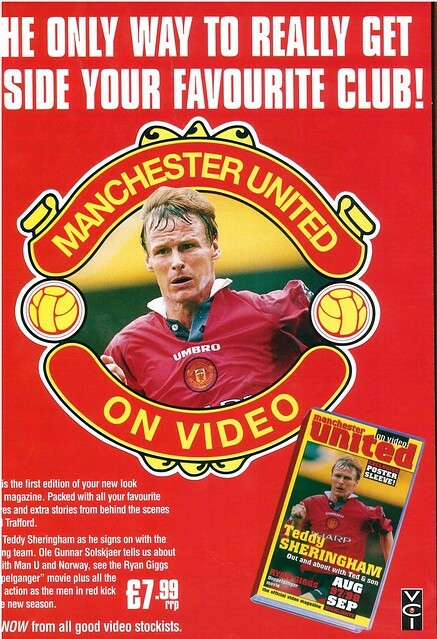 That man, was Michael O’Neill, but it wasn’t instant. A poor qualifying campaign for the 2014 World Cup saw Northern Ireland be in Pot five for the expanded Euro 2016. Suddenly, it all clicked, Northern Ireland won their group and went to France. They almost went to Russia. Now, they were wanting to head to, um, any one of thirteen countries co-hosting Euro 2020, for their second successive European Championship. It would be tough though, as Northern Ireland, now in Pot three for Euro 2020, found themselves in a group with Germany and Holland. Oh well, but even if we finish third, we’ll have a shot at the Play-Offs. Well, no, that’s not guaranteed, thanks to the sham that is the UEFA Nations League. 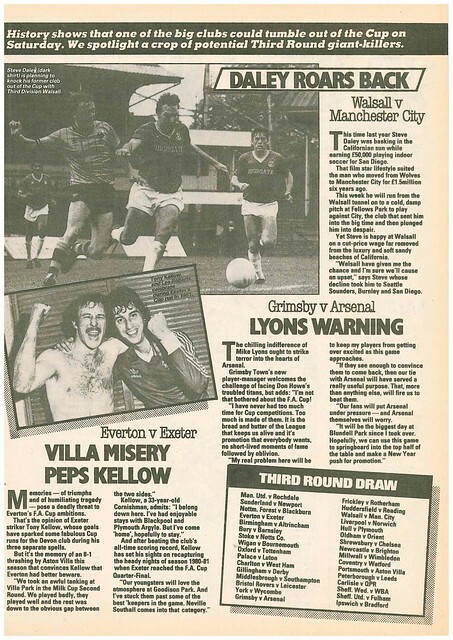 Northern Ireland’s first foray into that competition wasn’t exactly glorious, losing all four games and being relegated. Quite how, I don’t know, Northern Ireland had enough chances to win all four games. That frustration was worse when you saw Austria’s group – Poland, Latvia, Macedonia, Slovenia and Israel. If Northern Ireland had that group, we’d be very confident of qualifying automatically from that. Northern Ireland had a chance with just over a minute on the clock, with Niall McGinn dragging a shot just wide, failing to emulate Ivan Sproule scoring an early goal against Estonia at Windsor Park. Paddy McNair then had Northern Ireland’s first really chance of note when he headed over from close range when he really should have scored. Craig Cathcart had a header easily saved before Jordan Jones dragged a shot just wide, as Northern Ireland went in search of the opening goal they so desperately needed. If Northern Ireland could get it, they could charge on and win this game comfortably. If Estonia got it, it could be a long night against a team set up to defend, now with something to defend. The most curious thing about Estonia’s play in the first-half, was their goalkeeper always kicking out wide from goal kicks, usually conceding throws or possession. All that Estonia could offer as an attacking force in the first-half was a couple of corners that were easily cleared. If the first-half was a false start, the second literally was as Estonia had to kick off three times before they got it right. That third time was to ironic cheers. Hopefully, Northern Ireland fans would be cheering at some point for real as Estonia are kicking off, this time after a goal. Northern Ireland began the second-half a lot quicker, outing more pressure on Estonia’s goal. 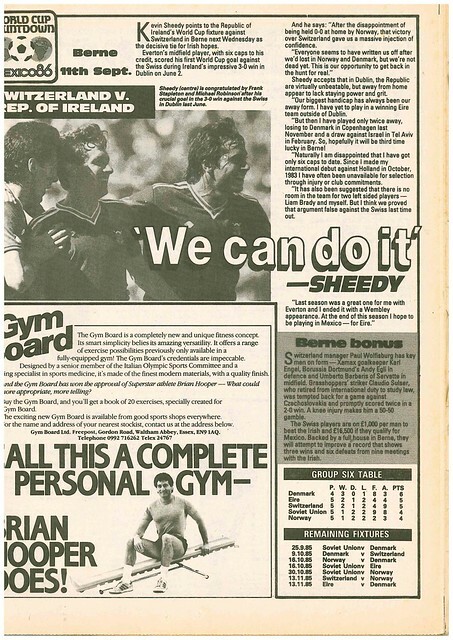 That pressure was rewarded on 55 minutes when an attacking move which saw Northern Ireland seem to always have one more player and were a pass ahead get rewarded when Niall McGinn finish into The Kop. Despite being 1-0 up, Northern Ireland still needed a second goal just to be sure. 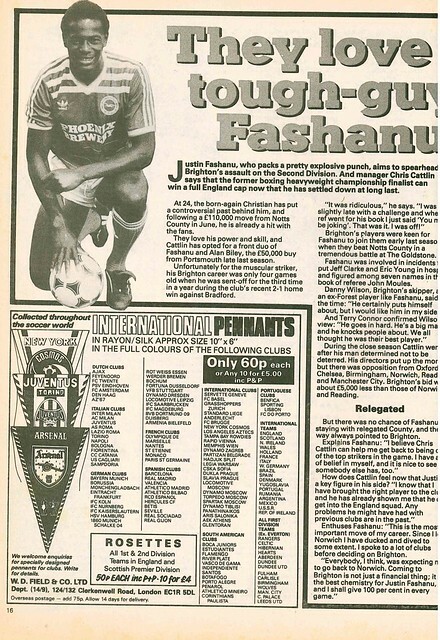 They got a reminder of that when Estonia got in behind Northern Ireland’s defence, only for Bailey Peacock-Farrell to make himself big and deny Henri Anier. 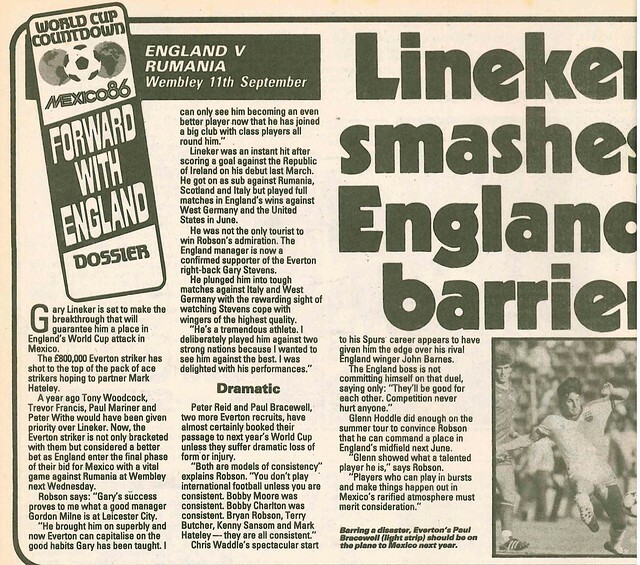 Any nerves that may have been in Windsor Park were soon gone when Goerge Savile won possession (I originally though it was going to get pulled back for a high foot by him) before launching an attack which resulted in him being fouled for a penalty. Steven Davis made no mistake from the spot to make it 2-0, and secure the Northern Ireland the points. They could have secured them by a bigger margin, but Josh Magennis, now on as a substitute, enduring a frustrating evening, hitting everything except the back of the net, but he never hid when he got the ball next time. Thankfully, the misses weren’t costly. With a Play-Off spot being determined by UEFA Nations League placings, 3rd place won’t be enough for Northern Ireland. It would only be enough if Austria and Bosnia qualify automatically. Austria lost their opening game, but no need to panic, it was against the team who is Pot one in their group, while Bosnia won. Northern Ireland can only help themselves, they simply had to get twelve points on the board before facing Holland and Germany. They have three of them. On to Belarus, arriving at Windsor Park three days later.